Kalergis Studios is a luxury accommodation by the sea, at Saint George Beach in Naxos Town. 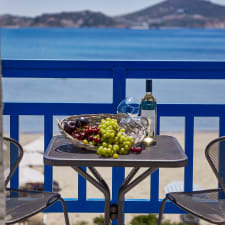 The accommodation is a typical example of Cycladic architecture with pure lines and the best sea view in Naxos Island. In Kalergis Studios, the blue of the sea and sky with the white of the buildings is harmoniously bound together. The wonderful garden, the balconies and verandas with sea view and the lounge café bar “Vamos” is the ideal place for relaxation and romance.